Hotel Garden, San Giovanni la Punta. Garden Hotel San Giovanni la Punta. 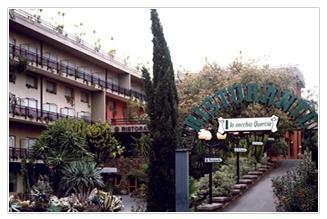 Let us welcome you to the Garden Hotel, just minutes from the busy heart of Catania. Our staff will spoil you with excellent service and the relaxing garden atmosphere will regenerate your spirit. The charming surroundings are ideal for a variety of occasions. "La Vecchia Quercia" restaurant and poolside terrace will delight you with their service and cuisine. Our catering staff is also on hand to help you to organize anything from a business conference to a private ceremony. Let us help make it an event to remember!! The hotel offers a number of services to make your stay enjoyable. Other than the "Vecchia Quercia" restaurant and poolside terrace we also have the Garden Lounge bar for a quick snack, cocktails or even just a coffee. We offer dry cleaning service, 24 hour front desk, room service, national newspapers, wireless internet connections, banqueting, private unattended parking, showroom, meeting rooms and conference hall, and an internet point.